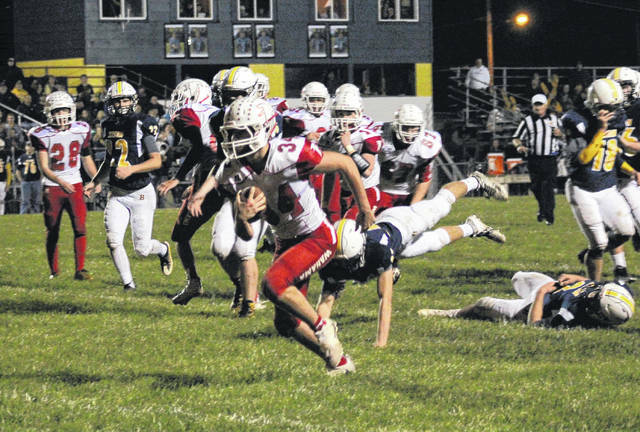 Wahama’s Christian Thomas breaks a 14-yard touchdown run during the second quarter of the White Falcons’ season finale on Friday night in Buffalo, W.Va. It took overtime, but Wahama ended up posting its first non-losing season since 2014 after squeaking out a thrilling 20-19 overtime victory over host Buffalo on Friday night in a Week 10 clash of gridiron rivals in Putnam County. The White Falcons (5-5) had lost three straight to the Bison before Friday and hadn’t won at BHS since a 66-18 decision back in 2013, Dave Barr’s first season as White Falcons head coach. Wahama finished the 2017 regular season with a four-game winning streak, which also last occurred in 2014. Johnnie Board scored the go-ahead touchdown in overtime on his only carry, a 1-yard run that made it a 20-13 contest. BHS scored and went for two, but Wahama’s defense held to secure the one-point triumph. Hannan (2-8) completed its 2017 campaign on a much different note after suffering a 65-0 setback to Cameron on Friday night, the fifth straight loss for the Wildcats headed into next year. Point Pleasant — which had a Week 11 bye on the schedule — will be the only Mason County program advancing to the 2017 WVSSAC playoffs. The Big Blacks (8-2) will be making their 10th consecutive playoff appearance and will learn who, when and where they will play in the Class AA opening round on Sunday. Due to an early deadline, the Mason County gridiron games from Week 11 will be available in the Tuesday sports edition of the Point Pleasant Register. Game stories will be available online at mydailyregister.com before appearing in print.